The first severe hurricane of the twentieth century to move across the North Carolina coast was a category three that passed near Hatteras on 13 Nov. 1904. The hurricane brought high tides and heavy rains, and a number of people drowned at New Inlet as a result of the storm surge. In September 1913, a short-lived but intense hurricane crossed over Core Banks into Pamlico Sound. The flooding that resulted in New Bern and Washington damaged crops, homes, and businesses. Reports of extreme damage came from Goldsboro, Tarboro, Wilson, Farmville, and Durham. In total, five lives were lost and an estimated $3 million worth of damage was done. In 1933 North Carolina was hit by two hurricanes in a single season. The first came on 22 August, producing high tides along the Outer Banks and causing crop damage as far inland as Granville County. The second, less than one month later, devastated the coastal cities, leaving 21 dead and damages of over $3 million. A Red Cross survey indicated that 1,166 buildings had been totally destroyed and 7,244 severely damaged. In 1944 North Carolina once again felt the effects of two hurricanes. The first, a category one, hit Southport on 1 August and brought winds of 80 miles per hour to Oak Island. The most extensive damage occurred at Carolina Beach, where 30-foot waves destroyed the town's boardwalk and a large number of beachfront homes. The total damage from the storm was in excess of $2 million. The second hurricane to hit, the Great Atlantic Hurricane of 1944, neared the Outer Banks on 14 September and passed just east of Cape Hatteras on its way to careening into Long Island, N.Y. While the eye of the hurricane remained offshore, sparing North Carolina's coast a direct hit, serious flooding took place in Avon, and high winds caused extensive damage in Elizabeth City and in the Nags Head area. While only one North Carolinian was killed as a result of the hurricane, the storm took nearly 400 lives as it tracked along the Atlantic Coast. The second half of the twentieth century saw a number of highly destructive hurricanes wreak havoc in North Carolina. The National Weather Service began naming hurricanes after World War II. In the years 1953 to 1955 alone, seven hurricanes struck the state, one of which, Hazel, has been hailed as one of the worst natural disasters in the state's history. 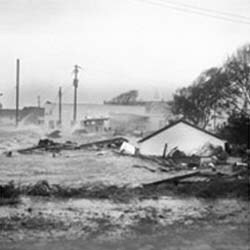 Sweeping inland near the North Carolina-South Carolina border on 15 Oct. 1954, Hazel brought with it winds of up to 150 miles per hour and massive storm surges that flooded the southern beaches. Barreling through the state, Hazel not only demolished buildings and bridges along the coast, but also brought destructive winds and rain in cities such as Wallace (Duplin County) and Parkton (Robeson County). In the city of Raleigh, it was reported that an average of two or three trees per block fell. Perhaps the most destructive hurricane in North Carolina history, Hazel took the lives of 19 people and injured over 200. Fifteen thousand homes and structures were destroyed, 39,000 structures were damaged, and a total of 30 counties received major damage. In all, Hazel caused approximately $136 million in property losses. Following Hazel, North Carolina was hit by a string of hurricanes throughout the remainder of the 1950s. Hurricane Connie, a category three storm that swept along the North Carolina coast on 12 Aug. 1955, caused large amounts of flooding in the eastern counties. Hurricane Diane swept right through the middle of North Carolina just five days after Connie had hit the coast. Coupled with the large amounts of water left by the earlier storm, Diane furthered the extensive flooding that was occurring along the coast, and, when it swept across the middle of the state, began to produce record amounts of rainfall in the northeastern region of the state. Combined, Connie and Diane accounted for over $80 million in damages in North Carolina. In September of that year, yet another hurricane struck the state. Hurricane Ione struck the coast just west of Atlantic Beach and brought with it massive amounts of rain that flooded the eastern counties. Nine North Carolinians were killed as a result of the storm, and an estimated $90 million worth of damages was done. In 1960, closing out a decade of destruction for North Carolina, the state became a victim of Hurricane Donna. Hitting on 11 September, Donna was responsible for extensive damage to coastal communities such as Atlantic Beach, Morehead City, and Beaufort. In addition, strong winds moved inland, causing destruction in Goldsboro, Kinston, and Greenville. In the end, Donna was responsible for eight deaths in North Carolina. From a meteorological standpoint, the 1960s proved to be a peaceful time in the coastal region, with no serious hurricane damage. Even in 1971, when Hurricane Ginger struck the state in late September, the storm lacked the intensity of the hurricanes that had torn through the state in the 1950s. In 1972 Hurricane Agnes swept across the interior of the state, causing damage primarily in the eastern part of the Blue Ridge Mountains. After Agnes, a period of seven years passed before Hurricane David struck the state, following its predecessor's path through the Piedmont region. Fortunately, there were no deaths in North Carolina as a result of the storm. The 1980s saw four major hurricanes sweep through the state: Diana in 1984, Gloria in 1985, Charley in 1986, and Hugo in 1989. Of these, Hugo, a category four hurricane, was by far the most devastating to the state. After first coming inland near Charleston, S.C., Hugo blasted its way up to North Carolina, swerving through Charlotte and Hickory. In Charlotte, strong winds ripped trees from the soil, and forests were destroyed throughout the state; the timber losses alone were valued at $250 million. Overall, Hugo was responsible for seven deaths in North Carolina and cost the state an estimated $1 billion. Hurricane Hazel caused flooding to reach rooftops of houses in Morehead City. Image courtesy of East Carolina University RENCI center. Available from http://www.ecu.edu/renci/StormsToLife/Hazel/environmental.html (accessed August 17, 2012). 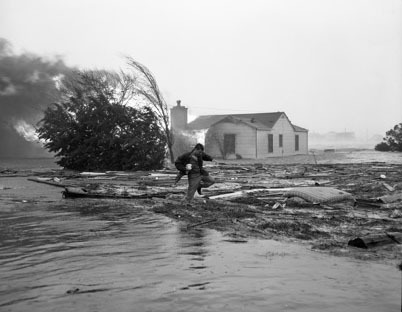 "Julian Scheer wading through debris after Hurricane Hazel (1954), Carolina Beach, NC." Image courtesy of UNC Libraries. Available from http://www.lib.unc.edu/blogs/morton/index.php/2008/09/398/p081_ntbs4_0013401/ (accessed August 17, 2012).